Experienced traders know that understanding risk and finding effective ways to manage it are fundamental parts of a successful trading strategy. While the risk of loss is embedded within the very nature of trading, keeping potential risk factors towards the front of your mind as you consider your options can greatly reduce the possibility of placing an unsuccessful trade. Markets can move quickly and unexpectedly. Major earnings announcements, political upheavals, or natural disasters are some of the events that can impact equities, bonds, and commodities. While volatility can provide trading opportunities, it can also pose significant risks. There is no way to completely avoid volatility in the market, but you can learn to manage the risks it poses to your trading. 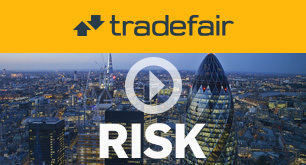 Tradefair's platforms can help you to manage your CFD positions. You can use order types, such as trailing stops, to exit trades at an acceptable price before the market goes too far against you. These order types can be accessed easily and quickly by right-clicking on a chart in Tradefair Pro. Most of them are also available in Tradefair WEB by clicking New Order and using the Type dropdown. A market order is a request to buy or sell at the current market price guaranteeing execution, but not price. As such, a market order may be filled at a different price than the price submitted by the customer. These orders guarantee execution at your specified price when you place a P&C order. Available in Tradefair Pro, this requires an extra charge and is not available for all markets. *Slippage on all stop orders is possible during times when Tradefair is closed, around fundamental announcements, and times of extreme market volatility. Slippage relates to orders being filled at a price which is worse than the stop price requested by the customer. CFDs are traded on leverage, which can be both a benefit and a risk. Leverage allows you to take a larger position with less capital, but a high degree of leverage can work against you as well as for you. When you trade, keep in mind that the leverage on your CFD is a significant factor that can magnify both positive and negative outcomes. You may end up losing more than your initial deposit. free, no- risk practice accounts so you can get a feel for the markets and our trading platform. This information should not be relied on as a substitute for extensive independent research before making your investment decisions. Tradefair Financials is merely providing this for your general information. In addition, any projections or views of the market provided by this author may not prove to be accurate. Tradefair Financials will not be responsible for any losses incurred on investments made by readers and clients as a result of any information contained in this page. Tradefair Financials does not render investment, legal, accounting, tax, or other professional advice. If investment, legal, tax, or other expert assistance is required, the services of a competent professional should be sought.